Former Fork & Wrench chef emphasizes Spanish and Italian flavors. During his senior year at the University of Maryland, chef Brian Lavin spent a semester abroad, eating his way through Spain, Italy, and Southern France. Now, eight years later, the Howard County native is opening his own spot inspired by this concept. Gnocco will debut at 3734 Fleet Street on June 14 in the building that previously housed Brewers Hill Pub & Grill in Highlandtown. With businesses like Snake Hill and Old Line Spirits drawing attention to the neighborhood, Lavin thought that the space and the timing were both ideal. 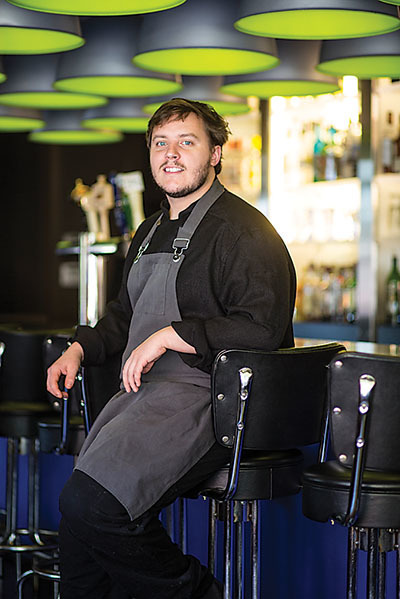 The chef, who formerly headed up kitchens at Salt and Fork & Wrench, says that the vibe at the 52-seat spot will be similar to the intimate cafes that he explored while living in Europe. The seasonal menu will rotate weekly, featuring 10 small plates, four pastas, and a few heartier entrees designed for sharing. Highlights will include squid ink gnocchi with tomatoes and spicy breadcrumbs; agnolotti pasta with goat cheese, brown butter, and hazelnuts; razor clams with tarragon salsa verde; salmon with fava beans and crème fraiche; half-roasted chicken; and whole-grilled bass. Lavin says that he will also make it a priority to get creative with odd cuts of meat like sweetbreads and beef tongue. Under the direction of Lavin’s college friend Sam White—who was also his roommate throughout his semester abroad—the beverage program will have a heavy European slant, as well. White, most recently a manager at Cinghiale, will emphasize Spanish and Italian wines, after-dinner sherry drinks, and a variety of amaro and vermouth options. “[White] and I are really big on amaros, and he also has a lot of knowledge on wine from working in the industry for so long,” Lavin says. The building itself, which has free parking, has been completely transformed from its former sports-bar state. It now boasts brighter copper tones with hints of blue, new light fixtures, and rustic reclaimed wood furniture made by local interior builder Joshua David Crown Studios. Lavin—who has recently spent a lot of time assisting Fork & Wrench owners Andy Gruver and Jason Sanchez with the build-out of their new spinoff Modern Cook Shop—is excited to get back into the kitchen. He says that “gnocco,” the Italian word for dumpling that is also used as a term of endearment, sums up the spirit of the restaurant.